Syncing individual sound elements with a video time-frame can be potentially confusing when outsourcing the soundtrack to a third party. This article explains how project management can help the process run smoothly. Typically, when we get an enquiry from a digital agency to create a video soundtrack they will have numerous parties involved in the production. They are the point of contact for their client but often outsource video and sound elements. Usually, (especially with big agencies) the outsourced parties will be instructed not to liaise directly with the client. With a clear procedure the process can be relatively simple. Without a clear plan the process can become muddled and the costs for additional production time can stack up. In my experience, agencies really want to nail down the costs as much as possible. In the first instance, the agency ‘storyboard’ the video or animation. At the same time, the script for the voice over is developed and notes are made about music requirements and sound effect placements. Once the client has ‘signed off’ the storyboard and script with the agency it is time to move to phase 2. Once the script is finalised, the agency needs to find a suitable voice over to record it. 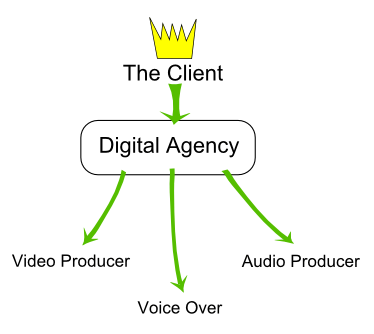 An agency will either use one of our voice overs or sometimes they hire voice talent independently and take them into a local studio so that the client / digital agency can direct the voice over session (usually budget dependent). The voice over file needs to be recorded ‘Dry’ and broadcast standard (no processing) ready for the next phase. Now that the voice recording is in the bag, the video producer or animator can record the scenes, edit and produce the entire visual element using the dialogue as a timing guide. The voice track will normally have its timing altered to fit the video. By editing the dry dialogue with the visuals the video producer can slip edit the scenes and chop the voice in order to create a draft version of the final video. The timing aspect of the video needs to be finalised before the soundtrack can be created in phase 4. At this stage, the video producer supplies a draft video with the temp dialogue attached. This is usually low resolution for convenience. The audio producer will then create a new voice layer from the ‘Dry’ voice over recording and apply audio processing to achieve the desired broadcast level and sound quality. The music track(s) and sound effects will also be added at the correct video time references. Once this is done and everything is mixed the entire soundtrack is rendered as a broadcast quality wave. If the agency / client are happy with the audio, the video producer imports the new soundtrack into the video timeline and renders it at HD quality. The video is now finished and can be used by the client. Here is an example of an animation that was worked on in this way. The video was originally silent.